After Darkness, Light celebrates Dr. R.C. Sproul’s four decades of ministry. 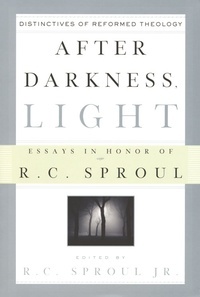 The motto of the sixteenth-century Protestant Reformers was, “After darkness, light.” As a Reformer in the church today, Dr. Sproul has helped spark a resurgence of Reformed theology. Proclaiming the Biblical truths of Reformed theology, this book examines the five solas of the Reformation and the five points of Calvinism, the cornerstones upon which Dr. Sproul’s ministry has been founded. Contributors include Jay E. Adams, Sinclair Ferguson, W. Robert Godfrey, Michael Horton, John MacArthur, Keith A. Mathison, Martin Murphy, O. Palmer Robertson, R.C. Sproul Jr., and Douglas Wilson. This book is well written by solid men. This helped clarify for me, in a concise way, the essentials of the five sola's and five points. It is a book even critics of the reformed faith should read, because it may clear a lot of misunderstanding.